Halloween is a great time of year: scary costumes, free candy and lots of great decorations. It’s just perfect for kids, isn’t it? But there are some things that aren’t great for children, like the open flames in jack o’lanterns or props that are a little too frightening for small kids. How do you strike a balance that will be safe for little ones, cool enough for bigger ones and fun for everyone? Below, we take you through some of our favourite child-friendly decorating tips for Halloween. Small children have a harder time distinguishing pretend from real, and that pop-up zombie that your friends all love could really scare little ones. But everyone loves cute things, so for the most child-friendly Halloween, think adorable, not terrifying. Children are careless, especially when candy is being offered. Combine that with naked flames right by the doorway they are running toward, and you can see where we’re going with this. Thwart any unintended Halloween consequences by substituting real candles in pumpkins and other decorations for battery-powered ones. You can even get ones that flicker, adding even more atmosphere to your home. Or, you can create a modern effect with strings of lights. Traditionally, we take sharp knives and hack away at the tough skin of a gourd to create this, the ultimate Halloween decoration. But obviously skilled knife work is not appropriate for all children. Let your very youngest children decorate a painted pumpkin with stickers, markers or crayons. For older kids, you can create diorama or Mr Potato Head-inspired jack o’lanterns. That way, everyone can get into the decorating spirit safely. If you do want to get a little scary, try cutting the shapes of bats, mice or other creepy crawlies out of black paper or felt. You can hang them on walls, doorways and just about anywhere else. They’ll make everything spooky, without the risk of causing children to trip. You can buy soap with toy insects in, or you can do it yourself (the tutorial for the image above is here). Either way, you’ve got the perfect way to make your guests feel completely gross while they clean up. As a bonus, it’ll make hand washing more fun for the kids! 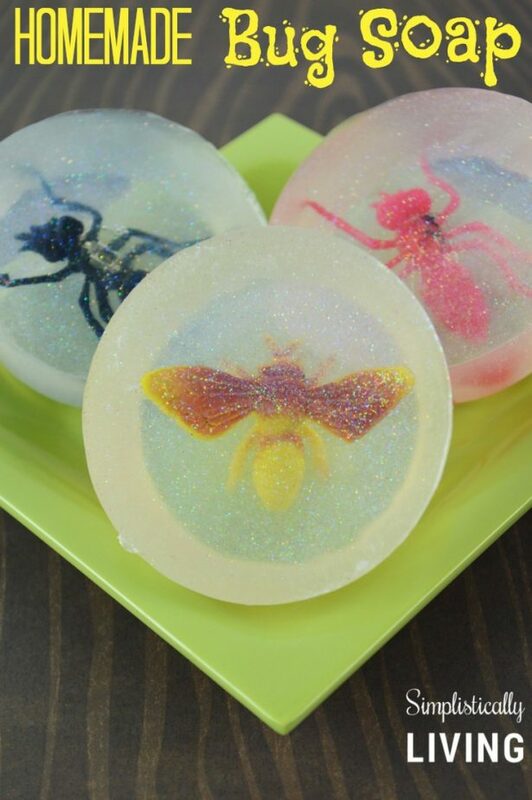 If you don’t fancy making your own bars of soap, just pop those insect toys in ice. Same effect, so much less effort. Okay, that headline doesn’t make a lot of sense, but these bloody handprints are made by spreading PVA glue over your hand and letting it dry, just like your kids (and you) love to do. 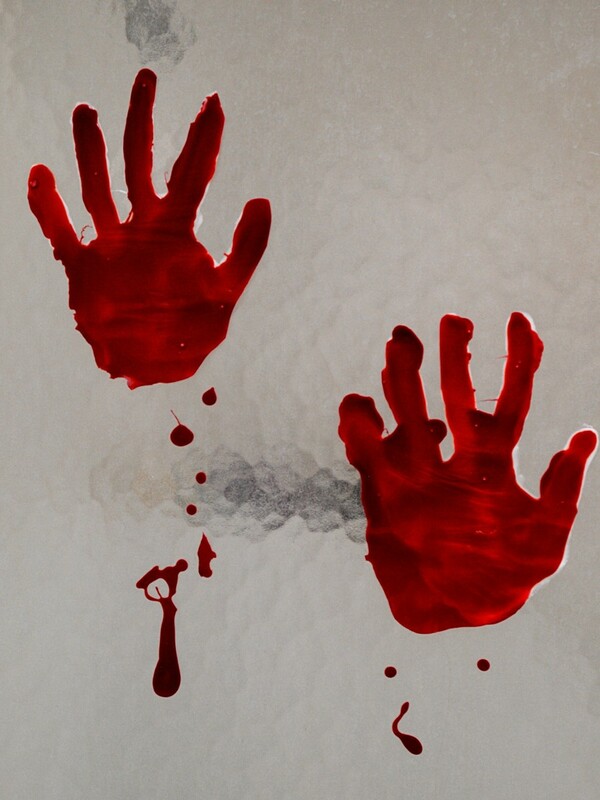 Only this time, you mix the glue with red food dye and press it onto cling film to make it look like a bloody hand print that will stick to most smooth surfaces. Get the step-by-step guide here. Make sure your kids have enough energy to make it through their Halloween celebrations with these cute mummy pizzas. If you’re feeling creative (and have loads of time), you can even carve up other veggies to make pizza Draculas and Frankensteins like these people did. And if you want to sneak something a little healthy in, try making a veggie-packed pizza sauce. With that, you should have a great – and safe – Halloween that kids of all ages can enjoy. Happy Halloween, everyone!